yourPrint.in lets you customize and create your own photo printed Beer Mugs & Beer Glasses Online within seconds. These mugs and glasses can easily hold you beer for you and can be printed with your Images, Photos, Text, Artwork as per your imagination. Drink your Beer in a cool beer mug, which has been designed specially as per your requirement. Our Beer Mugs are created by the best designers - You! What is a Beer Mug? As the name suggests, a beer mug is used to hold and drink beer. At yourPrint, we make this regular kitchenware product special by letting you create your own beer glasses with your photos. This makes the beer mugs purchased from yourPrint very special for you and your family. 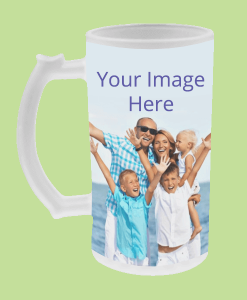 You customize these mugs with almost anything - from your family pictures to your company logo. This makes these mugs versatile and suitable for any ocassion - be it personal or professional. This is the specialty of Photo Printed Beer Mugs. Beer Mugs and Glasses with your Pictures - the perfect Gift! Without doubt, these printed beer mugs are the best gift to give to your loved ones, friends, employees or business partners. Since these are printed with the pictures of your choice, they are as unique as you and make your home-bar look special. The mugs are available in 2 variants - Frosted and Transparent. Both are printable and can be customized with our easy to use online product designer interface. Photograph Printed Beer Mugs and Glasses - your best companion at parties! We all like to party once in a while. Now make your parties special with our range of high quality photo printed beer mugs and glasses. These are created specially for you and by you! Flaunt your new, customized beer glasses in front of your friends and stand out in the crowd. Why be regular when you can be special with our range of Customizable Beer Mugs?